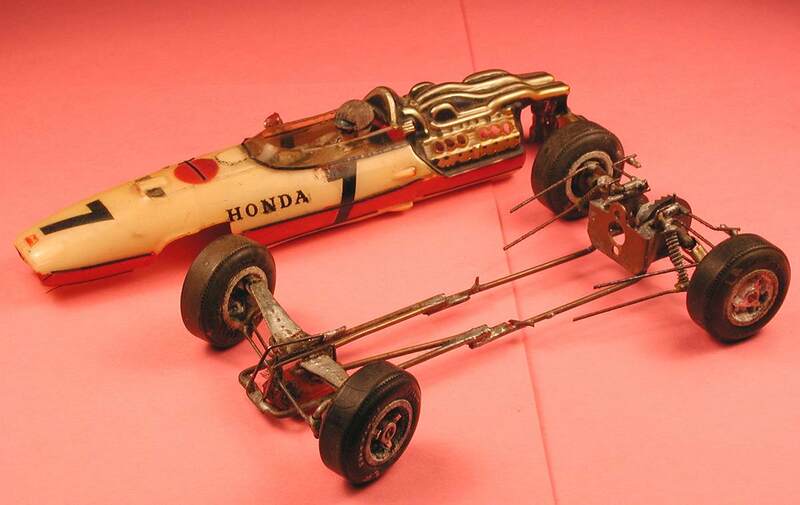 Steve Okeefe's Honda F1 GP was the concours award winner at the Third New York Area Car Model Race, in the fall of 1967. 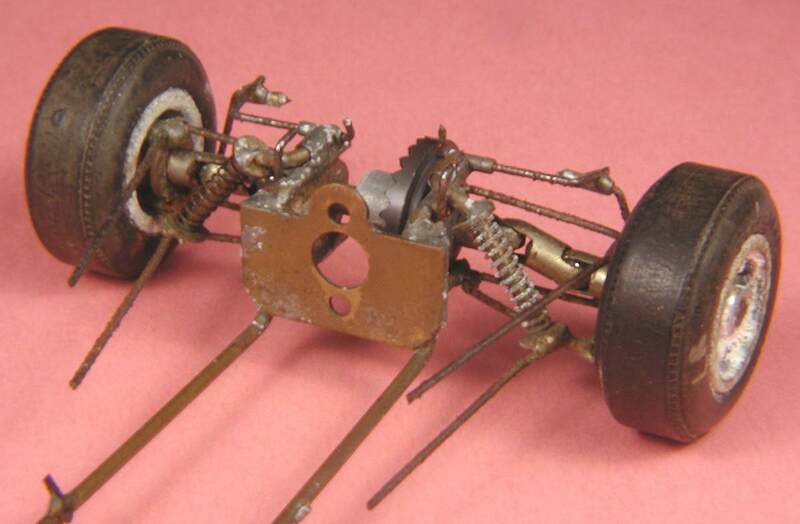 His scratchbuilt four wheel independent suspension deservedly won him more than fifteen minutes of fame! This one is truly a labor of love. Inspired by the 1966 movie Grand Prix, I built this '65 Honda F1 during in the fall of 1967, when I was 16 years old. My building skills were still in a rather early stage of development, but that didn't matter, I was on a mission from the slot racing gods. If I couldn't buy one of these marvelous examples of mechanical intricacy, I was going to build one. Although it could be driven, my Honda F1 was never even close to being competitive out on the track; that was not its purpose. It was never intended to be more than a self-propelled showpiece. Except for the motor bracket, outboard rear wheel bearings and guide bearing, the chassis is entirely scratch-built, and has functional four-wheel independent suspension and steering. The center section is 1/16" brass rail, because that's what I had on hand at the time. Front and rear wheels are Cox magnesium and, unfortunately, as you can see in the pictures, are severely (perhaps terminally) corroded. Suspension parts are 1/32" piano wire in 1/16" brass tubing hinges. Upper control arms in the front have sheet steel "covers", dimpled with a punch to simulate rivets. 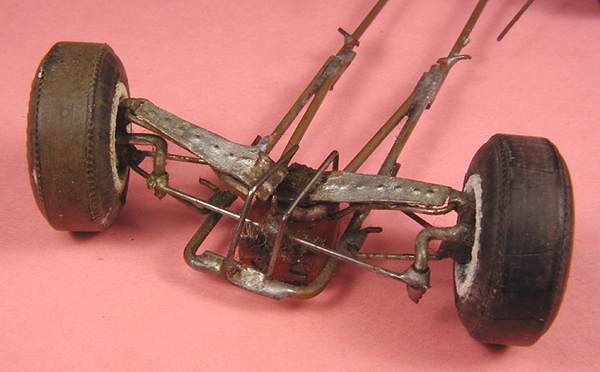 Each steering knuckle consists of two pieces of 1/16" brass rod soldered together, one vertical serving as the kingpin, and one horizontal forming the axle and steering arm. 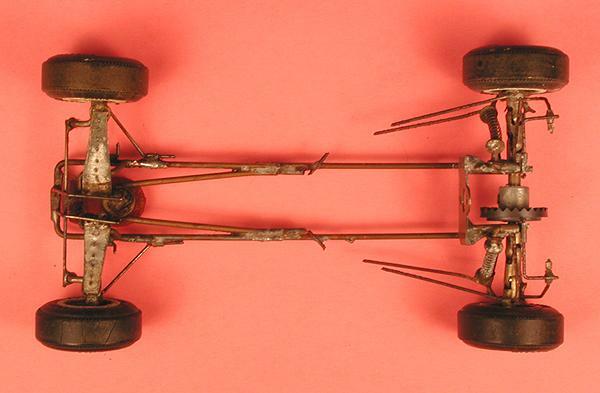 The tie rod is a single piece of 1/32" piano wire, with bits of brass tubing at the pivot points, linking the two steering arms and guide flag together. Rear suspension follows prototype design, including an anti-sway bar, single upper and wishbone type lower links, and combination shock and spring units. The coil springs were stolen from ball point pens. Forward upper and lower link attachments, on both sides of the body near the driver's position, had to be simulated. Rear wheels are threaded, and locked on the axle stubs with three prong knockoff jam nuts. The rear axle contains thirteen separate parts, and includes four "universal joints" (two on each side) that allow the suspension to move. These universal joints consist of six carefully cut out pieces of 5/32" nickel-plated brass tubing and four 1/8" steel balls (from a bicycle crank bearing). To form each flexible joint, two "fingers", 180 degrees apart, are cut out of the ends of each of the pieces of brass tubing, then the two pieces of cut out tubing are slid together with the fingers interlocking (see the drawing). The fingers are then bent part way around the steel ball, and the open ends of the brass tubing are soldered onto the axle stubs. This arrangement works reasonably well, although I doubt it could withstand a great deal of torque. Nevertheless, this most complicated part of the chassis never failed during the few times it was entered in races, and was required to qualify out on the track. You may notice that the chassis has been cut apart in the middle and soldered back together. When I first built the chassis, I followed the proportions and dimensions of the vacu-formed body I was going to use. I completely missed the fact that this made the wheelbase too long (in scale). My competitors for concours awards however, did not miss the opportunity to point this out to the judges! Two of my racing friends, Al and Marty Pollack, who have always been smarter than me about problems like this, came to my rescue. They simply cut the chassis in two, soldered it back together to give it a correct scale wheelbase, and cut the body to fit. It literally never occurred to me to do this.